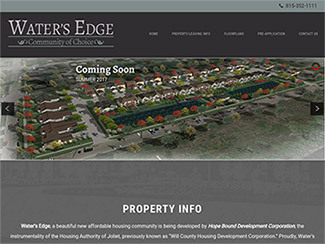 Water’s Edge, a beautiful new affordable housing community is being developed by Hope Bound Development Corporation, the instrumentality of the Housing Authority of Joliet, previously known as “Will County Housing Development Corporation.” Proudly, Water’s Edge is our third redevelopment project in the City of Joliet. A $21MM project, Water’s Edge will consist of 68 single family and townhouse style homes, located on the site with Wallace Street to DesPlaines Street, McDonough Street to Water Street, and Water Street to Wallace Street. The first five homes are expected to be ready for May 1, 2017, lease-up. For more information including floor plans and a pre-application for the Water's Edge Community, visit our website at WatersEdge.community. The relocation of Des Plaines Gardens residents and the subsequent demolition of the public housing development’s main site, first built in 1956, is just the beginning of the Housing Authority of Joliet’s plan, initiating a complete transformation of the DesPlaines Gardens community to an Affordable Housing “Community of Choice”, which will be a source of pride for all its stakeholders. Rather than simply rehabbing the units, the HAJ is creating a marketable mixed-income development that will incorporate tax-credit rental housing. Major assets include its proximity to downtown and multiple sources of public transportation, several thriving educational institutions ranging from early education programs or preschool through undergraduate and graduate degree programs, as well as multiple neighborhood shopping and related support facilities. This area is a city-sponsored, targeted redevelopment area and represents a core portion of the City’s anti-poverty strategic plan. The City has been funded to implement a proposed $31 million multi-modal transportation facility within a half-mile of the public housing community. The residents of Des Plaines Gardens have all received a Housing Choice Voucher and have received mobility counseling, relocation assistance, and education about existing opportunities, including their right of first refusal for the new homes at Water’s Edge. The physical relocation was complete on March 14, 2016. Demolition of the site is now in progress. We anticipate lease-up of the first 68 homes to begin July 2017. The Transformation of Des Plaines Gardens to Water’s Edge will replace all 122 demolished units, but on two (2) separate sites, allowing de-densification and the creation of green space. Construction and financing are expected to occur over two (2) phases. Phase One: The Transformation of Des Plaines Gardens will begin on the main site described above and will become a mixed-income property with sixty-eight (68) affordable/restricted rent units. The proposed unit mix consists of fifteen (15) units at the 30% of AMI level, twenty-six (26) at the 50% AMI level, twenty-seven (27) at the 60% of AMI level; a Community Center / Management Office will also be built. The homes will be a combination of single family and townhome style units, all with attached garages and at least one and a half (1.5) bathrooms. Average unit size will be 1,100 square feet, excluding the garage. Each unit will be constructed on a slab and include energy efficient appliances. All sixty-eight (68) homes will be issued a Project Based Voucher in order to ensure maximum affordability. The tenant will be responsible for electricity and natural gas. The property will pay water/sewer/trash. This site will likely follow the lease-to-own / good stewardship model we have used in previous redevelopment projects. Phase Two: The Transformation of Des Plaines Gardens is anticipated to continue on 20.23 vacant acres, owned by the Housing Authority of Joliet and shall consist of approximately fifty-four (54) units. Phase Two is anticipated to begin within twelve (12) months after lease-up of Phase One (depending on financing availability).